WaveScan Technologies Pte. Ltd. is an A*STAR spinoff specializing in microwave & mm-Wave NDT sensor systems. Our technology builds upon nearly a decade-long R&D on microwave & mm-wave NDT sensors at Institute for Infocomm Research, A*STAR, Singapore. We provide an end to end cloud based AI-enabled inspection solution, together through the partnership with autonomous vehicle companies. Smart IoT sensors, deployed on autonomous vehicles, along with a centralized cloud-based AI-enabled analytics solution is the future of predictive maintenance systems for tomorrow's Smart Cities. At WaveScan, it is our mission to introduce such automated electromagnetics (EM) sensor-based NDT solutions towards safer liveable cities. Conventional NDT sensor technologies including X-Ray NDT, ultrasonic NDT, eddy current NDT and microwave GPR NDT possess limited detection capabilities. Available handheld sensor technologies in market, aggravated by the manual inspection and non-standardized procedures makes the NDT process time-consuming & tedious. Our sensors provide an end to end efficient infrastructure maintenance solution by digitizing entire NDT process. In conventional NDT processes, experienced field inspectors are needed to perform measurements and process/interpret data. 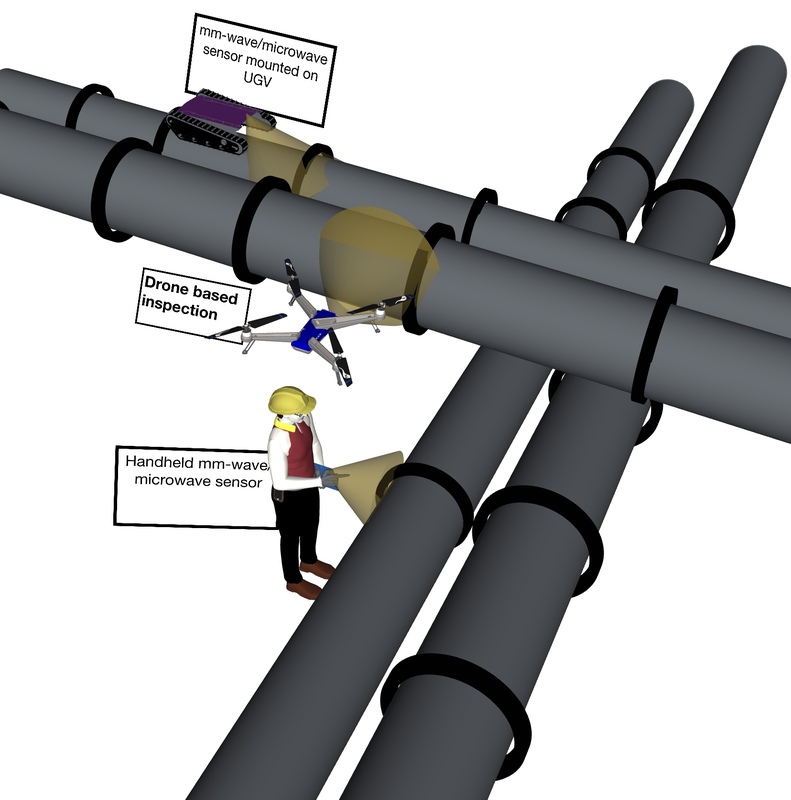 AI enabled defect analytics and prediction of defect lifecycles helps in replacing manual NDT process and reducing the requirement of skilled field inspectors. Manual inspection & analysis leads to conflicting conclusions based on individual’s perspective. 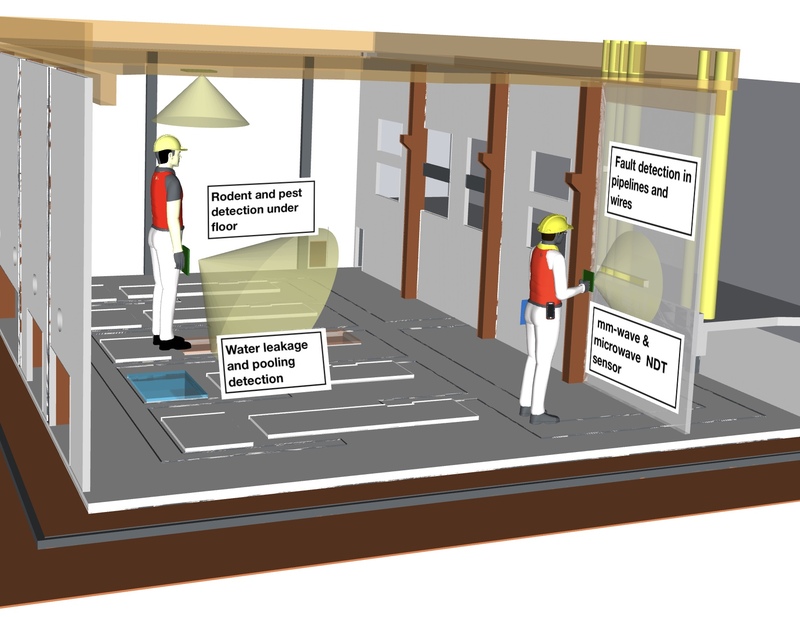 Currently there is no standardisation of the NDT process for infrastructure facilities. Our ecosystem of intelligent sensors enables standardization of NDT inspection and testing process leading to a ~30% increase in productivity with minimal downtime. End-to-end wireless microwave & mm-wave based NDT sensor solution with AI enabled capabilities integrated in the cloud for smart predictive maintenance of infrastructure facilities. Microwaves and mm-waves are capable of penetration through materials such as tiles, PVC, building facades, dielectric composites, concrete, wooden panels, etc. The sensors are designed to transmit and receive electromagnetic waves in the microwave/mm-wave spectrum. Based on the received signals and back-end signal processing, the sensors can infer useful information on the subject under test. These sensors are non-contact and detect surface defects such as cracks, corrosion, precursor pittings and embedded anomalies such as disbonds. They also identify volumetric defects such as voids and delaminations and are capable of imaging defects up to sub-mm scale resolution with varying stand-off distances. The core patented technology behind the sensors has been developed by our founders in A*STAR over a decade-long period growing capability through various market verticals such as aerospace MRO, oil & gas pipeline inspection and infrastructure inspection. Non-destructive testing (NDT) is used extensively during the manufacturing & maintenance of aircrafts. Wings, fuselages and fasteners are exposed to harsh conditions and lead to corrosion & cracks which are hidden under paint and primer. Other defects include precursor pitting and cracks emanating from fastener and rivets. These surface defects are detectable using our advanced mm-wave NDT sensors with sub-mm scale resolution. 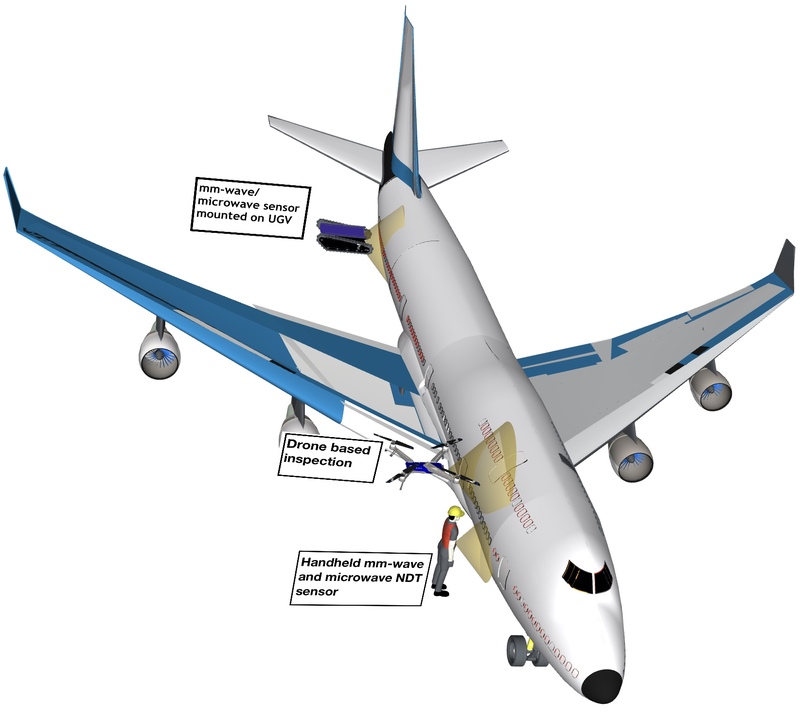 Our microwave & mm-wave wireless NDT sensor systems are well-aligned with the innovations in the aerospace industry towards predictive & proactive maintenance practices. Pipelines are exposed to a variety of harsh environmental conditions like temperature, pressure, and moisture that leads to corrosion & cracks. To protect pipes from impact, abrasion, and corrosion; a variety of insulation methods are used, like rock shield, high-density polyethylene (HDPE), etc. Even with this protection, the pipeline is susceptible to corrosion & cracks and need to be inspected from time to time. The removal of the insulations is costly, time-consuming and effects the downtime of the gas supply. Our effective mm-wave NDT sensor systems provide useful information (like detection of corrosion, cracks & damages) with ease of non-contact testing (without removing the insulation). Our microwave & mm-wave wireless NDT sensors are integrable with the existing Oil & Gas pipeline maintenance systems and align well with the digital transformations happening in this NDT market vertical. Building facades need to be periodically inspected and maintained to ensure that the facade elements (e.g., wall plasters, tiles, and claddings) or any installations (e.g., awnings, sunshades, and air-conditioner units) that attach to the facade remain intact so that they do not fall and pose a danger to the people and properties below them. 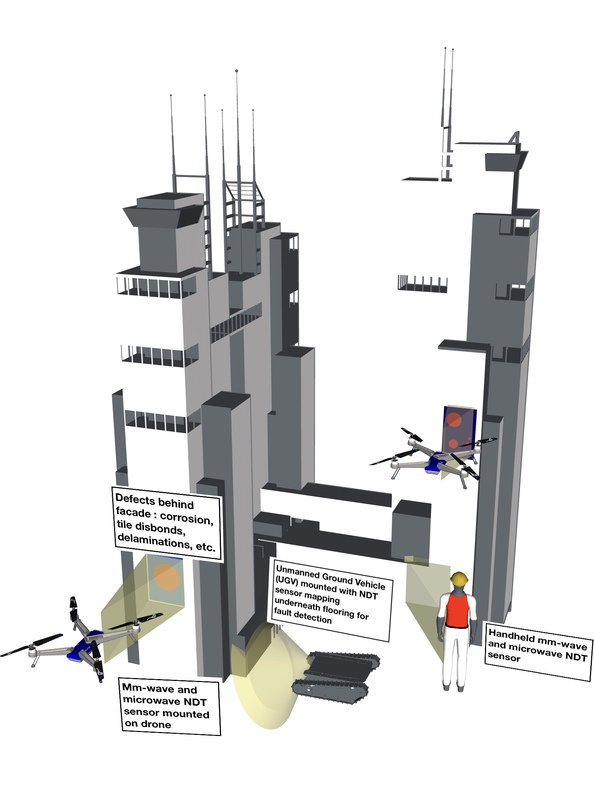 Visual drone-based inspections address part of the building facade inspection problem as they can only view & inspect surface abnormalities of the buildings. Our microwave NDT sensors transmit electromagnetic waves that penetrate through these building facades and detect defect patterns like metal cladding/corroded metal brackets, corroded or deteriorated external fixtures and damages with reinforced concrete. 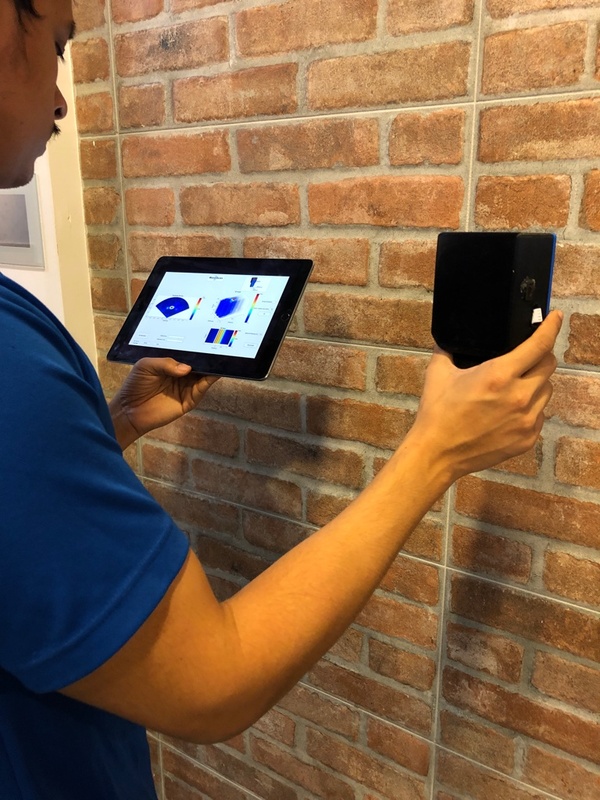 Our mm-wave NDT sensors can detect tile disbonding, brickworks bulging, facade deformations, hairline cracks, and corrosion. 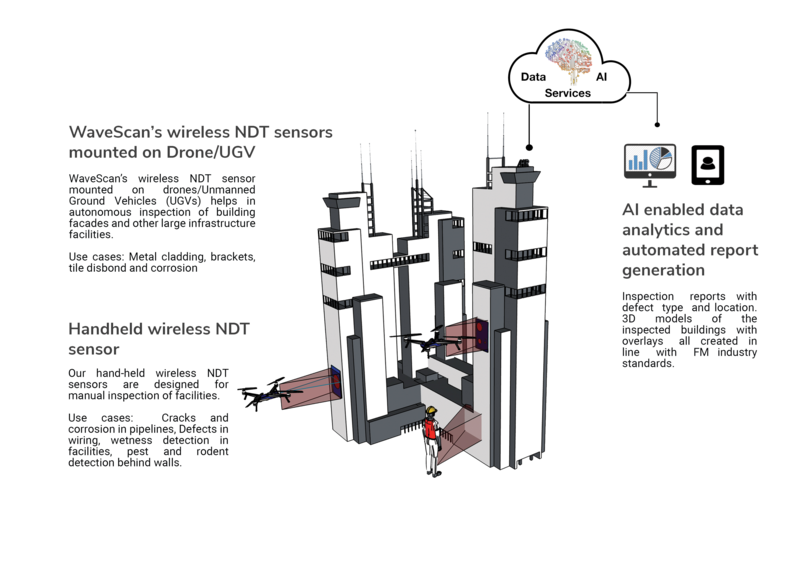 Together, through partnership with autonomous vehicles companies, we provide end-to-end AI enabled NDT inspection solution for the inspection of high-rise building facades. Our handheld microwave/mm-wave wireless sensor technology can inspect indoor facilities such as office & residential buildings for anomalies like checking for the location of hidden wiring & pipelines, water leakage in concealed pipes behind walls & flooring, and rodent infestation behind ceilings, walls or floors. Our wall/ceiling mounted sensors are useful in predictive facility management by providing information such as water spillage, and real-time people counter information resulting in the efficient utilization of available resources towards smart FM solutions. 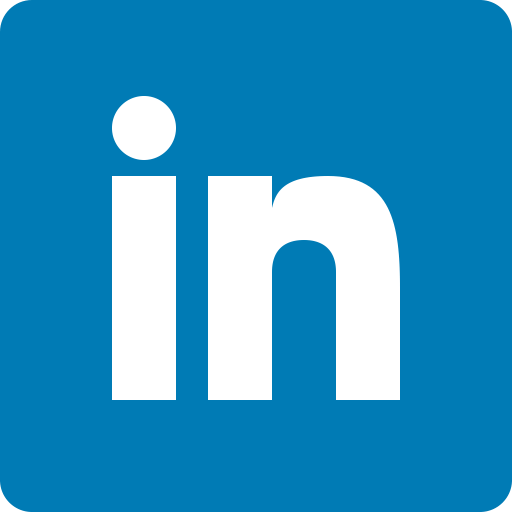 Kush is a technologist by training, a scientist by profession, and an entrepreneur by DNA, which stems from his early childhood involvement in family pharmaceutical business. He has created technology business ventures from concept to launch and beyond within friends & family. 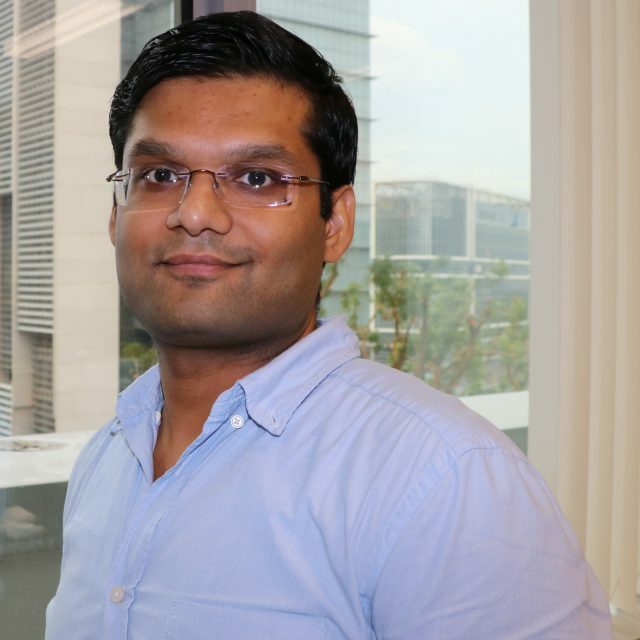 To date, Kush has co-founded three Singapore based tech-startups through his inventions – Synapse Technologies (ML & Internet of Robotic Things), SmartClean Technologies (IoT & AI for Predictive Cleaning), and WaveScan Technologies (Microwave & Millimeterwave IoT sensors & AI for Non-destructive testing & Predictive Maintenance). He holds a Ph.D. from the National University of Singapore, an M.S. from Nanyang Technological University, and a B.Tech. from College of Engineering Roorkee India, all in Electrical and Electronic Engineering, specializing in component and system level wireless interfaces. Kush has close to a decade of experience in the R&D & management of wireless technologies and, has authored 25 refereed papers, book chapters, and four patent filings in Singapore. He is also a part of the editorial review committee of over a dozen journals affiliated to IEEE, IET, Taylor & Francis, Wiley, and Springer. Currently, Kush is serving as the Associate Editor for IET Microwaves, Antennas & Propagation, and IET Electronics Letters journals. 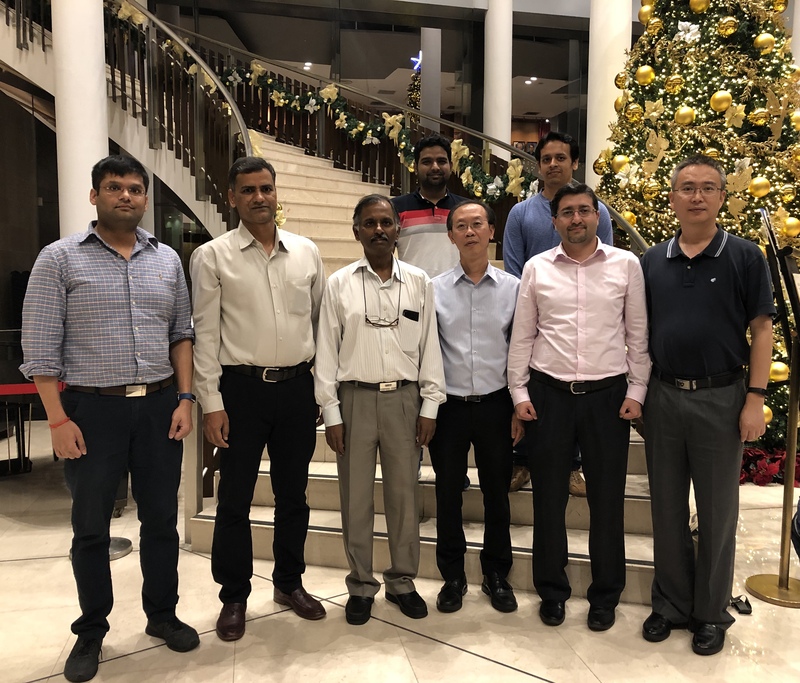 Kush is an Executive Committee Member of IEEE Singapore Section, where he co-chairs and leads the professional activities of IEEE in Singapore region. He is affiliated with AP, MTT, ComSoc, EMBS, IoT, and RFID Societies as a Senior Member of IEEE. Kush has worked with the CGI (Canada), Institute for Infocomm Research, A*STAR, NUS & NTU, and is actively involved in supporting and building the tech-startup ecosystem in Singapore. He firmly believes in teamwork and that, private-public entities will have to collectively work towards shared sustainable strategies, incentives, and a value system as we strive to transform human lives with disruptive technologies to improve the current state of the world and build a competitive, yet healthy & productive future for our younger generation. Dr Karim has over 15 years of industry, research and academic experience. Presently working as a Senior Lecturer at Nanyang Technological University (NTU), Singapore. Before joining NTU, he was a Deputy Department Head/Project Manager/Research Scientist at Institute for Infocomm Research, A*STAR, Singapore. He has lead and managed R&D projects in the area of sensing, internet of things (IoT), and energy harvesting. He held a concurrent appointment as an Adjunct Assistant Professor at National University of Singapore from 2009-2017. From 2005-2007, worked as a Test Engineer at Emerson Process Management, a US MNC. Dr Karim received PhD degree in Electrical Engineering from Nanyang Technological University (NTU), Singapore and a Master of Business Administration (MBA) from Lancaster University, UK. He has has published over 60 technical scientific papers in reputed international journals/conferences and delivered several invited talks. He is a Senior Member of IEEE and also the Vice chair in IEEE Singapore Section. Arokiaswami Alphones is currently Assoc. Professor at Nanyang Technological university and the chair for IEEE Singapore Section. He received his B.Tech. from Madras Institute of Technology in 1982, M.Tech. from Indian Institute of Technology Kharagpur in 1984 and Ph.D. degree in Optically Controlled Millimeter wave Circuits from Kyoto Institute of Technology (Japan) in 1992. He was a JSPS visiting fellow from 1996-97 at Japan. During 1997-2001, he was with Centre for Wireless Communications, National University of Singapore as Senior Member of Technical Staff, involved in the research on optically controlled passive/active devices. Since 2001, he is Associate Professor at the School of Electrical and Electronic Engineering, Nanyang Technological University, Singapore.. He has more than 30 years of research experience. He is in the editorial review board of IEEE Microwave Theory and Techniques and Microwave and Wireless Components Letters. He has published and presented over 300 technical papers in International Journals/ Conferences. His current interests are electro-magnetic analysis on planar RF circuits and integrated optics, metamaterials, microwave photonics, and hybrid fiber-radio systems. His research work has been cited in the book “Millimeter Wave and Optical Integrated Guides and Circuits”, Wiley Interscience publication. He has delivered tutorials and short courses in international conferences. He had written a chapter on “Microwave Measurements and Instrumentation” in Wiley Encyclopedia of Electrical and Electronic Engineering 2002, and a chapter on “Optically Controlled Phased Array Antennas for UWB RFID Reader” in Wiley’s Handbook of Smart Antennas and RFID Systems in 2010. He is a Senior Member of IEEE. He was involved with the organization of APMC’99, ICCS 2000, ICICS 2003, PIERS 2003, IWAT 2005, ISAP 2006, ICICS 2007, ICOCN 2008, APMC 2009, MWP 2011, RFIT 2012, TENCON 2016, PIERS 2017 and APMC 2019 conferences. Justin Dauwels is an Associate Professor with School of Electrical & Electronic Engineering at Nanyang Technological University (NTU). His research interests are in Bayesian statistics, iterative signal processing, and computational neuroscience. He enjoys working on real-world problems, often in collaboration with medical practitioners. He also tries to bring real-world problems into the classroom. Prior to joining NTU, Justin was a research scientist during 2008-2010 in the Stochastic Systems Group (SSG) at the Massachusetts Institute of Technology, led by Prof. Alan Willsky. He received postdoctoral training during 2006-2007 under the guidance of Prof. Shun-ichi Amari and Prof. Andrzej Cichocki at the RIKEN Brain Science Institute in Wako-shi, Japan. He obtained a PhD degree in electrical engineering at the Swiss Polytechnical Institute of Technology (ETH) in Zurich in December 2005, supervised by Prof. Hans-Andrea Loeliger, and was a teaching and research assistant at the Signal and Information Processing Laboratory (ISI) of the Department of Information Technology and Electrical Engineering at ETH Zurich from 2000 to 2005. In 2000 he received the engineering physics degree from the University of Ghent. From 1999 to 2000, he was an exchange student at ETH, and completed his master’s thesis at the Institute of Neuroinformatics in Zurich. Justin was a visiting researcher at the MIT Media Lab (Physics and Media Group) in Fall 2003 and the University of Ghent (Digital Communications Research Group) in January 2004. In Spring 2004 he was an intern at the Mitsubishi Electric Research Lab (Cambridge, MA) under supervision of Dr. Jonathan Yedidia. He has been a JSPS postdoctoral fellow (2007), a BAEF fellow (2008), a Henri-Benedictus Fellow of the King Baudouin Foundation (2008), and a JSPS invited fellow (2010). He is a member of the IEEE and the IMS. He is a research affiliate with Stochastic Systems Group (SSG) at the Massachusetts Institute of Technology, the Neurology Department at Massachusetts General Hospital, and the RIKEN Brain Science Institute. Her links to alumni in the venture space were instrumental in the 2015 formation of “INSEAD Alum Ventures (IAV)”, the school’s first dedicated seed fund, by Alumni – for Alumni. Professor Zeisberger is known for her extensive research on PE in emerging markets, and her output is a function of her close working relationships with private equity firms and their investee companies, institutional investors, Family Offices and Sovereign Wealth Funds. Joining Academia in 2005 after a 16-year career in investment banking & alternative investments, allowed her to leverage her extensive network and combine her passion for education & innovation by connecting academia with industry. In 2010, she launched INSEAD’s popular elective “Managing Corporate Turnarounds,” which combines in-class case studies and visits from industry professionals with an intensive computer-based simulation involving the iconic car brand SAAB and its struggle with bankruptcy. Over a full weekend student teams work to rescue the distressed car manufacturer by drawing on their management, finance and operational skills while facing increasingly complex decisions impacting both the firm’s short-term liquidity and long-term value creation. Students consider MCT the perfect course to put their MBA skills to test; corporations see the simulation as an opportunity to prepare their senior executives for challenging times ahead. Professor Zeisberger is a founding committee member of the Financial Women’s Association (FWA) in Singapore and was previously on the Board of the Singapore Venture Capital Association (SVCA). She has worked with clients in China, Hong Kong, Malaysia, Thailand, Taiwan, Europe & the Middle East and continues to advise institutional investors, Asian family offices, sovereign wealth funds and regulators on Financial Market Dynamics, Risk Management and Private Capital related issues. We are a group of scientists and engineers that apply principles of electromagnetics to enable new ways of sensing applications. Dr. Nasimuddin is a senior scientist with A*STAR, I2R under the satellite division. Dr. Nasimuddin received his B.Sc. degree in 1994 from JMI and his M.Tech. and Ph.D. degrees in 1998 and 2004, respectively, from University of Delhi, India. Dr Nasimuddin has worked as a Senior Research Fellow (1999-2003) in DST sponsored project and Council of Scientific and Industrial Research (CSIR) grant Senior Research Fellowship in Engineering Science at Department of Electronic Science, University of Delhi, India. He has worked as an Australian Postdoctoral Research Fellow (2004-2006) in awarded Discovery project grant from Australian Research Council at the Macquarie University, Australia. Currently, he is working as a scientist at the Institute for Infocomm Research, Singapore. He has published 168 journal and conference technical papers. He has edited and contributed a chapter to a book “Microstrip antennas” published in 2011 by InTech. His research interests include multi-layered microstrip-based structures, millimetre-wave, RFID reader, GPS/GNSS, satellite, TV white space, RF energy harvesting systems, UWB, beam-scanning/beamforming, metamaterial, CP microstrip antennas. He is a Senior Member of the IEEE and the IEEE Antennas and Propagation Society. He was awarded a senior research fellowship from the Council of Scientific and Industrial Research, Government of India in Engineering Science (2001-2003); a Discovery Projects fellowship from the Australian Research Council (2004-2006); Singapore Manufacturing Federation Award (with project team) in 2014, and the Young Scientist Award from the International Union of Radio Science (URSI) in 2005. © 2019. WaveScan Technologies Pte. Ltd. All Rights Reserved.